November is National Diabetes Month and is observed to shed light on the devastating impact it has on millions of Americans. Current estimates of type 2 diabetes (previously called adult-onset) put the number of Americans with diabetes or pre-diabetes at 100 million. Particularly worrisome is 30% of adults in the US have prediabetes and 1 in 4 adults with diabetes or prediabetes do not know they have it. These statistics are sobering as the numbers continue to climb every year. Could you be the 1 in 4? “Adoption and maintenance of physical activity and exercise are critical for glucose management and overall health”. In both type 1 and type 2 diabetes aerobic exercise increases cardiorespiratory capacity, decreases insulin resistance and improves cholesterol levels. In type 2 diabetes, aerobic exercise is able to bring down the A1C level triglycerides, and blood pressure. Regular exercise improves blood glucose control and combining it with nutrition and diet changes often reduce or eliminate the need for prescription medications. And because diabetes is a risk factor all its own for a faster decline in functional ability and muscle strength, resistance training is particularly important in the fight. Along with improving muscle strength, and fat to muscle ratio, resistance training helps the muscles use glucose more efficiently and lowers insulin resistance and improves blood pressure. Resistance (strength) training can include free weights, body weight or elastic resistance bands. Prediabetes is classified as higher than normal blood sugar levels that have not yet reached the full-blown diabetes stage. Prediabetes is a stern warning that you are on a slippery slope. And without lifestyle changes typically leads to type 2 diabetes within 5 years. Prediabetic individuals may prevent/delay its onset with modifications to nutrition and physical activity. 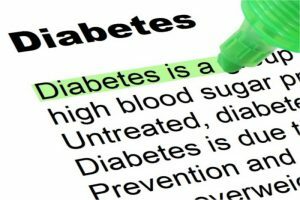 Although diabetes is called a ‘silent disease’ as symptoms can be subtle and often overlooked, the damage it will do if left untreated can often be disastrous and sometimes even deadly. Without intervention, many people are at risk of chronic high blood sugar levels which cause damage to the blood vessels affecting the pliability of the vessels to expand and contract. Over time, the blood vessels lose their ability to relax so they remain contracted and this leads to hardening of the arteries. Reducing blood flow, in turn, increases the risk of heart attack and stroke. Other complications include loss of vision (which oftentimes can lead to blindness), kidney failure, and nerve damage which can result in amputations of toes, feet, and legs. Along with medications to reduce blood sugar, exercise and nutrition changes have been shown to have a profound effect on diabetes management without the reported side effects of the most commonly prescribed diabetes medications. Physical activity including aerobic and resistance training are highly recommended by the ADA for prevention of prediabetes and type 2 diabetes as well as for overall health, well-being. Based on the ADA’s research and findings Both aerobic exercise and resistance training help control blood glucose levels, while flexibility and balance exercises (especially for older adults with diabetes) help maintain mobility, increase range-of-motion and reduce fall risks. It’s clear that for prevention and management of diabetes lifestyle changes to physical activity and nutrition are highly encouraged for optimal results.